Although shopping may not be the top priority of your Kenyan vacation, there's no doubt that souvenirs are an excellent way of taking your memories home with you. In recent years, Nairobi has earned itself a reputation for being unsafe, and as such many visitors choose to bypass the capital in favor of the country's rural game reserves and coastal resorts. However, while it's true that one needs to exercise a certain level of common sense whilst exploring Nairobi, there are plenty of places that offer pleasant and rewarding shopping opportunities. Like most major capitals, Nairobi has good and bad areas, and a little forward planning goes a long way towards ensuring that your experience is a positive one. Generally speaking, markets and shops on the city's outskirts are less crowded, less overwhelming, and often better value. In this article, we look at a few of the best options for the discerning souvenir shopper, focusing on places that specialize in high-quality items designed to be both beautiful and unique. Cavernous arts and crafts showroom Spinners Web is currently located in Spring Valley; although a move is scheduled for the near future. Here, nearly 400 different vendors congregate under one roof to sell their wares, which range from hand-woven woolen fabrics to animal-printed pottery and soft leather goods. The items at Spinners Web are of exceptionally high quality, and represent some of the country's best up-and-coming designers. If you loved the unique interior decorations of your camp while on safari, there's a good chance you'll find something similar here. 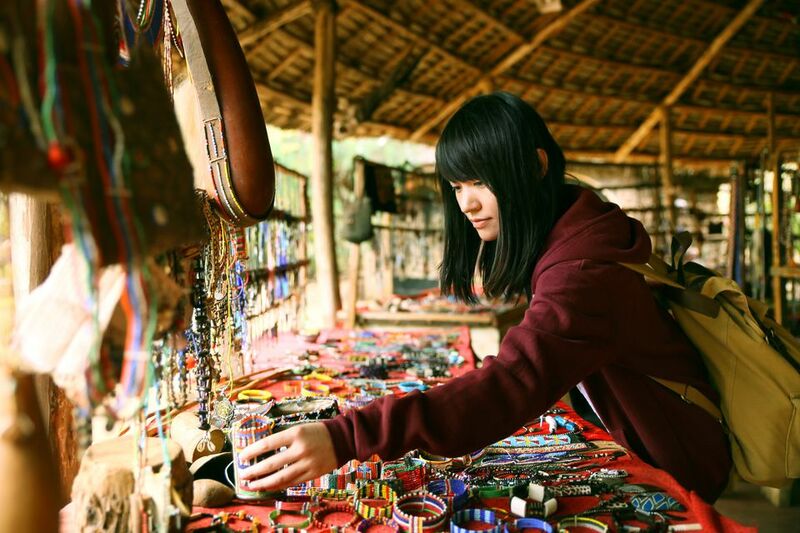 A popular stop for Nairobi tourists, the Kazuri Bead Factory is located in Karen. Here, visitors can take a tour of the factory and watch each step of the bead-making process. The factory was set up to provide employment and health care for impoverished single mothers, and seeing its success firsthand is a moving experience. The ladies are proud to show off their work, and when finished, Kazuri's ceramic beads are sold loose or as completed jewelry pieces in the on-site shop. They are known for the quality and vibrancy of their designs and are sold all over the world. The Village Market is an upscale shopping mall frequented by expats and wealthy Kenyans. You'll find an impressive array of gift shops and clothing boutiques, the latter of which specializes in the latest trends as well as distinctively Kenyan fashions including shorts and dresses made from kikoi fabric. You can find lots of chic goods for the home here as well, while the large supermarket offers cheaper prices for those wishing to stock up on quality Kenyan coffee and tea. On Fridays, the mall hosts a Maasai Market, which offers Kenyan souvenir staples ranging from carved animals and masks to batik wall hangings. The best way to get around Nairobi is to hire a driver for the day through your hotel or safari company. They will be able to recommend a reputable driver, who will know how to navigate the city while making it much easier to transport your purchases around town. Plan your souvenir shopping for the end of your trip, as internal flights to and from the national parks have very strict luggage allowances.